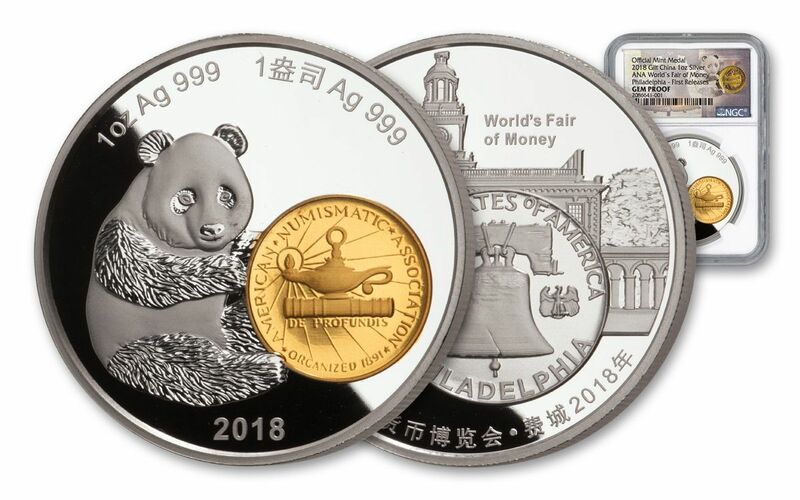 China’s Panda Enjoys Some Philadelphia Freedom on this 2018 ANA Show Proof! For more than 125 years, the American Numismatic Association’s (ANA) World’s Fair of Money has drawn coin and note collectors from throughout the country and, in recent years, throughout the world. The 127th edition in 2018 was held in Philadelphia, which hosted the event for the first time since 2012. Each year, the ANA show gives collectors the opportunity to gather along with mints, suppliers, and others in the field to discuss their favorite hobby and learn about historic coins, modern minting methods, and everything in between. Many mints take advantage of the opportunity by minting a piece just for the Fair – which is exactly what the China Mint did with these 2018 World Money Fair Panda Proofs. Now you can get your paws on one of those silver Pandas made available exclusively at the show! This one-ounce silver proof is struck in 99.9% pure silver and is a large 40 mm in diameter. The obverse mimics the design used by the China Mint for its 2000 Panda release. The Panda is shown holding the ANA’s “Lamp of Knowledge” logo along with the year date and precious metal content. As an added feature, the ANA logo is gilded in gold. The reverse features a modified version of the Franklin Half-Dollar with Philadelphia’s famous Independence Hall in the background. 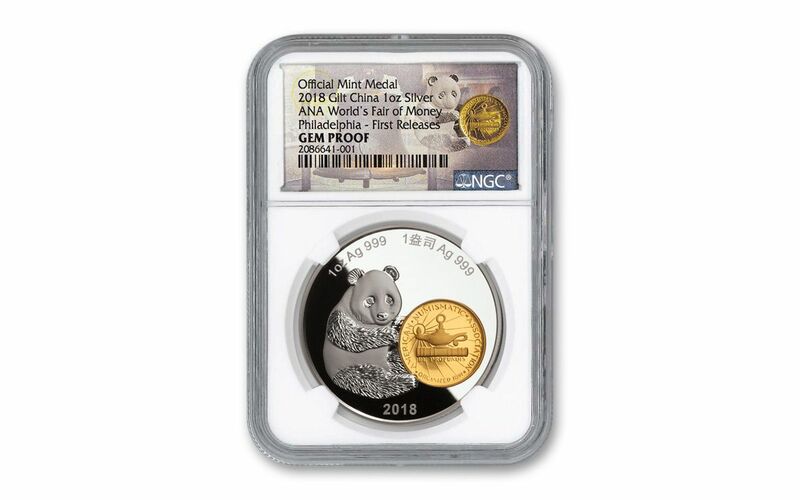 Certified as being in gorgeous Gem Proof Ultra Cameo (PFUC) condition and sealed in an acrylic protective capsule by the Numismatic Guaranty Corporation (NGC), each 2018 ANA Show Panda Proof also bears an exclusive label that designates it as a “Show Release” and First Releases (FR) piece. This mintage was extremely limited – just 1,888 – and will never be struck again. Since 1984, China has been issuing medals for international numismatic shows. The issues have become extremely popular among collectors not only because of their beautiful designs but also because of their exclusivity. That is because mintages of the coins are extremely limited, a stark contrast to the millions of bullion Pandas that are issued. This 2018 Silver ANA Show Release Panda is no exception. Not only is it a low-mintage piece, but it also pays homage to numismatic history, both within the show series and with a famous design related to the country of issue and the host country of the event. Now, this proof is exclusively offered in the United States by GovMint.com, so order yours before it’s too late! 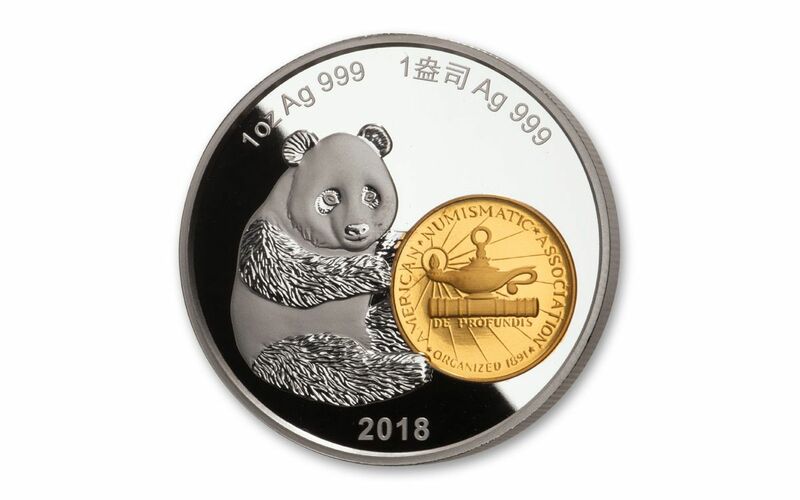 EXCLUSIVE RELEASE IN CHINA’S EPIC PANDA SERIES – This Silver Panda was struck exclusively for the 2018 ANA World’s Fair of Money Show held in Philadelphia. It features a sitting panda on the obverse with the ANA seal gilded in gold. The reverse shows a modified version of the Kennedy Half-Dollar’s Liberty Bell design gilded in gold. In the background is Philadelphia’s Independence Hall. STRUCK IN HIGHLY-PURE SILVER – Each 2018 Philadelphia ANA Show Silver Panda Proof was struck in one ounce of 99.9% silver and measures a large 40 mm in diameter. GRADED AND CERTIFIED BY NGC – Your 2018 Philadelphia ANA Show Silver Panda Proof has been certified and graded by the Numismatic Guaranty Corporation (NGC) as being in Gem Proof Ultra Cameo (PFUC) condition, meaning it was expertly crafted by the mint from hand-selected planchets, polished dies and multiple strikes to produce beautifully frosted details rising over mirror-like fields! KEY FIRST RELEASES CERTIFICATION – Your ANA Show Silver Panda Proof will also be certified as a First Releases (FR) coin by NGC, meaning that it was among the first struck by the mint and was verified within the first 30 days of issue. EXTREMELY LIMITED EDITION – Only1, 888 of these exclusive silver Panda proofs were ever struck by China’s Shanghai Mint – a fitting number since the number “8” has long been regarded as the luckiest number in Chinese culture. Your proof will come sonically sealed in an acrylic coin capsule with a special ANA-themed label. ANA Show Pandas are highly sought-after collectives that tend to sell out quickly. Don’t miss your shot at this 2018 ANA Show Panda!